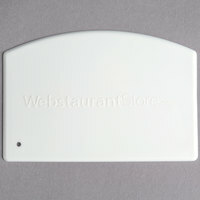 Get the most out of your product with this WebstaurantStore 5 1/2" x 3 3/4" straight edge bowl scraper! This white plastic, straight edge bowl scraper has multiple purposes for bakeries and kitchens everywhere. You can use this bowl scraper to scrape clean batter, icing, or dough from the mixing bowl, so you get more of your product into the baking pan and less into your dish water. You can also use the scraper to evenly distribute icing over cakes or cut dough if you're in a pinch. With a lot of baking this item is needed to scrape out the chocolate. Items works great it gets the job done and leaves little in the bowl. This bowl scraper is very durable while also being very flexible making it's amazing at getting everything out of your bowl. It's great that the cheapest one is also the best on the site! I highly recommend this product as it doesn't get much better as a bowl scraper. Really nice, low cost bowl scraper that is perfect for removing bread dough or cake batter from bowls. I also like using this for smoothing out edges on cakes. works great and gets the job done, will be adding to future orders. easily replaceable at the low price point, but expect that it will last for a while. These are perfectly sized for my needs. Can easily scrape everything from buttercream to royal icing to even think doughs and batter. Will definitely but again! They have the perfect amount of give, not overly flexible but not too stiff to make it impossible to form to your bowl. Great little bakery helper! I was pleasantly surprised when I received these dough scrapers. They are nice and thick and I think they should last a long time.. We will sure put them to the test! Must have in our bakery. They get every little last drop of fillings, creams, batter etc out of every bowl and bucket. And they last years! This bowl scraper was a free added on item for us and we are so grateful to have received it. It works perfectly for getting every last drop out of our mixer. It could not have come at a better time. We would definitely recommend. If you need a bowl scraper this is the one you you. holds up well and clings right up to the bowl just how you want it to. A staple for any kitchen, these plastic scrapers are a time and labour saver in a multitude of situations. I keep one of these at every station, including the dishroom - they make worktop clean-up a breeze! cheap but durable and very functional. It's flexible just enough but also sturdy enough to scrap sticky doughs from inside a mixer bowl. Only complaint is the hook hole could be bigger. We utilize this product quite often, works very well and has held up with constant use and let's face it abuse too! I would definitely recommend! I will be buying these again and again!! These are a must have in any bakery to ensure that you are not wasting batter or any other ingredients (which equals to wasting money) these work amazingly well with my Kitchenaid mixer bows to get all of the batter out quickly and efficiently. This bowl scraper has helped our restaurant keep our food cost down. Would recommend using this little tool to scrape bowls and make sure all product is saved. Solid bench scrape. Cheap, durable, and does what it is supposed to. Bought a bunch for our kitchen and they've held up well going through dish machine etc. This item came free with an order we purchased. and we love it! It is great for when we make pie dough and need to scrape down the sides of the bowl. I love these bowl scrapers! I use them for bread making-- scraping the bowl as I mix the bread, then to help with shaping high hydration, sticky loaves. You can't beat the price here. I usually put these in my sourdough starter pack when I teach workshops, and students love to use them. Quality bowl scraper that is rigid enough to scrape a mixing bowl clean, but flexible enough to bend around awkward angles of pots and pans. A very handy tool that should be in every kitchen. This scraper is really working well! Easy to grab and use. And cleaned so easily! People usually use one with handle on it. But I think this is more good to use. Good product for anyone who uses this type of product for their baking needs. I use these to help remove the dough from my mixer bowl. Helps get everything out. Highly recommend and very affordable and reliable for the price. Great quality and comparable to Ateco. I can scrape out every last bit of batter using this and I love how it can be used on both curved and flat surfaces. Sturdy bowl scraper that is durable. Washes well and doesn't change it's shape when it bends. Thick enough to hold easily in your hand, but not too thick so it's heavy. Good quality bowl scraper from Webstaurant store with a firm yet flexible plastic, and a good edge. It is a good size for medium sized mixing bowls such as 5 qts. Great product. Can be used for many different things in the kitchen. When making sauces it’s great for scraping the sides of the bowl and not losing any of the sauce. This is a standard straight edge bowl scraper. For what it is, the quality is good and it is sure to come in handy on more than one occasion. Very good quality. They bend just enough so that you can get every single corner. Very thick and durable. Amazing price. All bakers definitely need one of these. What can I say it was free and a pretty good item, You can’t beat free so thanks for the additional item that was free. Great value bowl scraper. Performs just as well as the Ateco brand ones. Perfect for scraping out sauces and dressings from mixing bowls and making doughs. This is a small and inexpensive little tool, but it is really handy when chopping. I use it to scoop or scrape up chopped nuts, fruits or veggies. It also works terri1fic when used for its intended purpose of scraping all batter or dough from bowls or pans. For the price it can't be beat. It's flexible and washes in the dishwasher. What more could you ask for for so little a price. I really enjoy using these bowl scrapers on a regular basis. They are thick, yet flexible and help with scraping out bowls as well as transferring product off the cutting board. bought these mainly cause they were less then a buck.they were used to sctape the mixing bowls we use and worked very well.will buy more asap. Does the job it is meant for. Nothing fancy, but I wasn't looking for fancy. I would buy again. I wouldn't use to scrape off dried food or something super difficult to get off. I purchased this straight edge bowl scraper to use in a kids cooking camp. The kids enjoyed using them so much that we decided this item would be our give away at next year's cooking camp. The kids were taught how to properly measure dry ingredients and use the straight edge to scrap off excess. Kids also used this scraper to clean some of the bowls. These are definitely weaker than other scrapers I have. I tried to get some crusted food off my end-grain cutting board, and the scraper edge just got all dinged up and is now full of notches. I had to get out an old plastic one to get the food off. Sure it will work fine for soft scraping jobs. These are not my favorite scrapers, but they're good quality. They're a little thicker than I like and not quite as stiff as some others I've tried. I have a bunch of silicone spatulas and spoonulas but for whatever reason, my kitchen was lacking a bowl scraper. I had a dough scraper for a long time but nothing to get the 1/4 cup of wasted dough or batter from the bottom of my bowl. Even if you intended to throw away the scraps, this makes a world of difference in cleanup to avoid ruining your sponge when wiping off dough. Great buy!